Rainbow Trout Entree with Yogurt added to Canary By Gorji upscale new mediterranean menu. A new entree, Rainbow Trout Yogurt with Kalamata Olives, Basil, Sumac & crispy Elephant Garlic joins another recent addition Paella with pulled rabbit, Spanish Chorizo, Mussels and Shrimp with Saffron White Wine Rice on the upscale menu. Other New Mediterranean Cuisine dishes added at Canary By Gorji, a D Best Restaurants, in Dallas, (Addison) TX are an appetizer and a favorite salad. 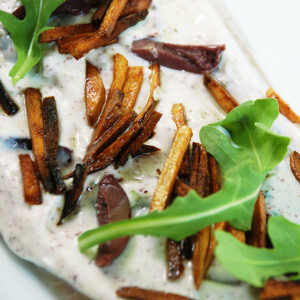 Pizza Gorgonzola Creme with Red Onion, Mushrooms and Arugula made with Chef Gorji’s Crispy Skillet Pizza joins the appetizers. Ruby Red Grapefruit, is back in season in Texas and Canary’s combines it with Goat Cheese, Persian Cucumbers, Dill, Red Onions and Grapefruit Vinaigrette on the salad list. No Replies to "Rainbow Trout & Yogurt Entree Added To Menu"